This past weekend I attended a garden bloggers meet-up, "Spring Fling 2012" in Asheville, NC. It was three full days (with 85 other garden bloggers) of touring gardens from the impeccable and productive to the visually masterful and curated to Wamboldtopia, which defies description. 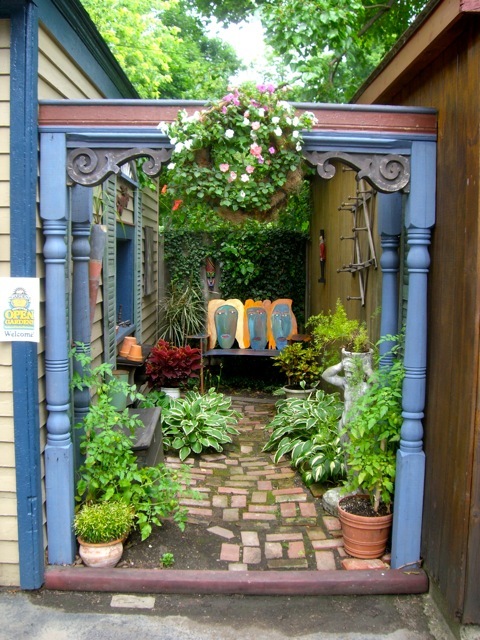 Located on Wambold Street, the garden belongs to an artist, Damaris, and a stone mason, Ricki, that thinks he's a pirate. 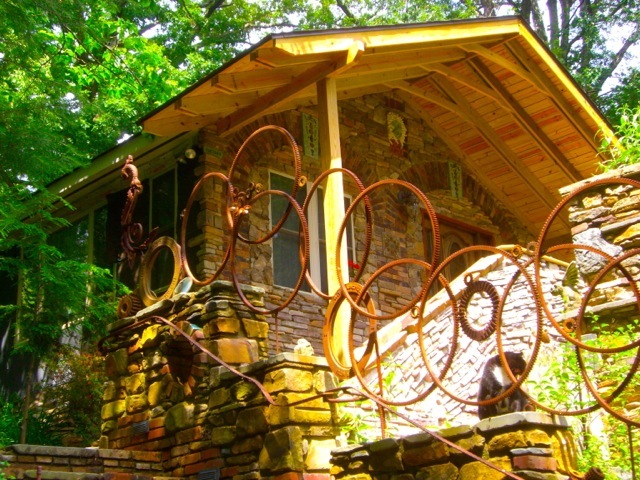 More posts on the garden and skeleton-oriented masonry in the future, I promise. There were hundreds of clever & fanciful uses of found objects as art throughout the hillside garden, but I think this was my favorite feature. 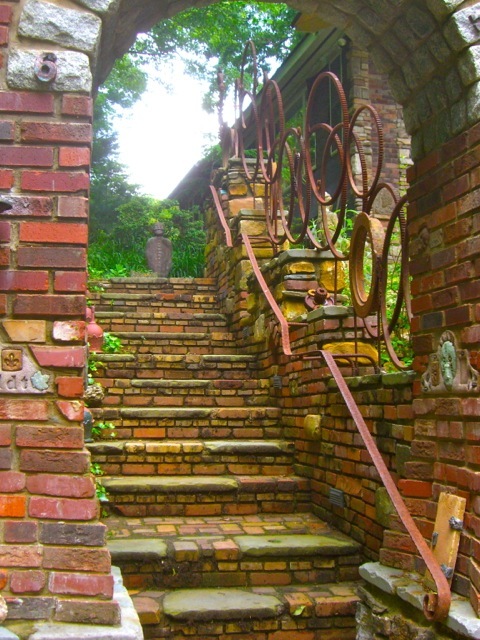 The dragon of rusted metal wheels and gears crawls along the front stair to the property, escorting scaliwags and scoundrels to the main house and upper gardens. 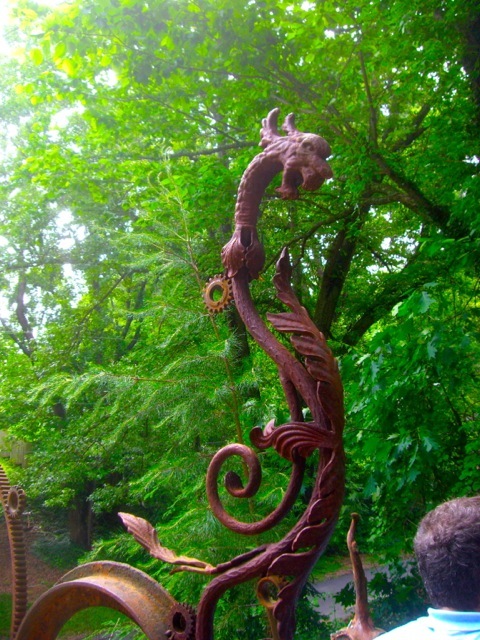 There were so many other things to see (fairy castles, skulls, artwork in the masonry, plants, fairy portals, statues found & made, to name a few) that I didn't take much notice of the dragon on the way in. Usually, when I visit a garden, I like to go through it the way a gardener intends - through entrance and exit - and then go back the opposite way to pick up what I hadn't noticed before. And the dragon is even more imposing when you're walking down the stairwell. We were also allowed up on the roof of the lower part of the house and had a great view of him there. I assume it's a male dragon anyway. I got to spend a little more time with Damaris when I met with the organizers of the West Asheville Garden Stroll (WAGS) on Sunday evening. I had dinner with them at Brotherhug and Janet's house (two of the organizers) and explained how Garden Walk Buffalo works and I quizzed them on how they operate. They're doing a lot right and I hope our talk keeps them growing stronger and in the direction that's good for their tour and city. 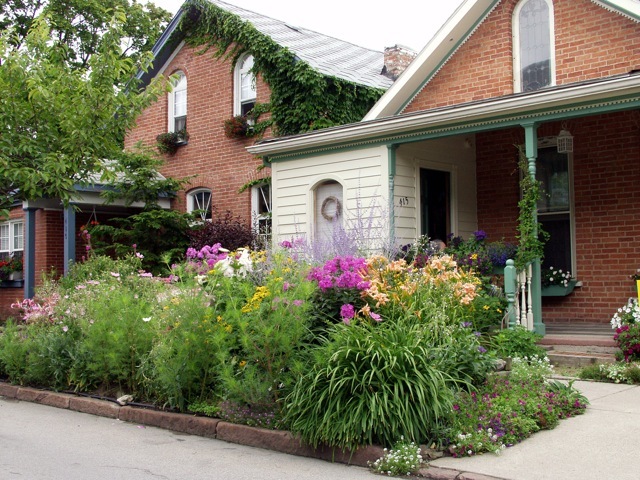 A unique feature to many Asheville gardens (other than great art incorporated into gardens) is the front yard vegetable gardens, or vegetables grown with ornamental plants in front yards. One of the organizers is from Buffalo - grew up right here in the heart of the Garden Walk area, just two blocks away from me. I can't see growing vegetables in my front yard. But I will not rule out a dragon. Nice shots of the dragon! See you in San Fran next year! 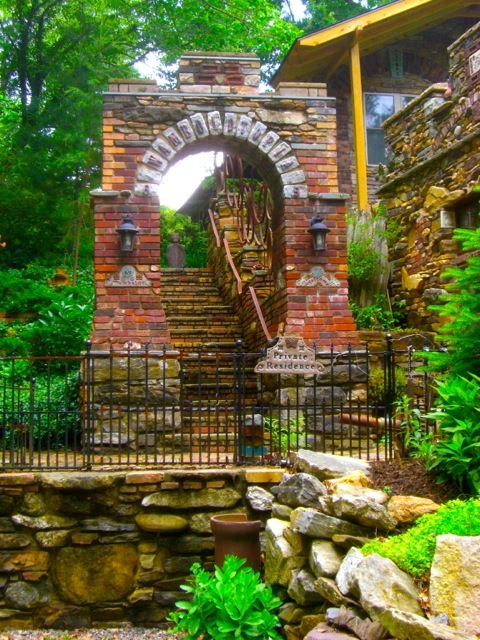 Love those shots of the entrance and the house! 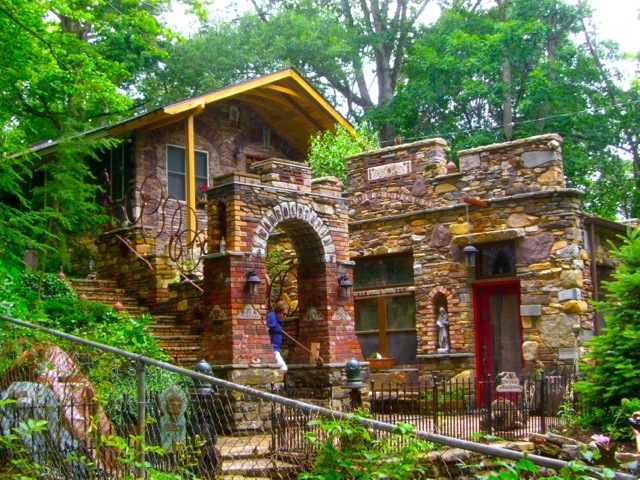 What a remarkable creation Wamboldtopia is -- and it was special to be able to meet Damaris and Ricki, too -- amazing artists in diverse media -- so much of it reflected in their garden. Glad we had a chance to visit in Asheville. Your pictures are almost as good as being there. Very creative and I can see veggies handing from those cone planters by your front steps....ha! Sorry that I couldn't be there, but pre-wedding events for our son's wedding required my attendance. Someday! I have high hopes for you! The right people doing the right tasks is essential. I was not around the first couple years of our tour - it was mostly one guy doing nearly everything. The more people involved at the onset, the stronger it'll be. It was great to see you again. Onward to San Fran! Visiting Wamboltopia was like leaving the planet for just a little while. I['s as much about the people as anything else in that garden. No. The photos are NOT as good as being there. And where were you, may I ask? Your presence was sorely missed. I was hoping to have finally met you. Alas, not this time. We've probably been in gardens at the same time together on the other side of the earth and not known it. 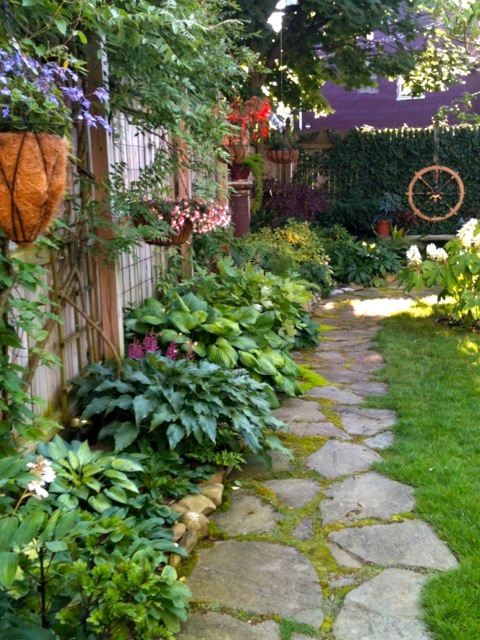 There's only a few bloggers out there that cover "garden destinations." You had a good excuse though. Congratulations on your son's wedding. You know what they say about the blinding glimpse of the obvious? How in the world did I overlook the dragon???! I think I was so overwhelmed by all the minutiae that I missed some of the big picture. Thanks for sharing what I so sadly missed! Lovely photos! Like the others have said, your dragon shot is great!! I think we all could walk through that garden again and not take the same pictures we did the first time, and still come away with a lot of photos! Nice meeting you in Asheville, hope your trip home was a good one. lovely post!thanks for sharing the photos. There was so much to see, I felt I was racing through every corner. But glad I took the time to talk a little bit to Ricki and Damaris. Such a fun, creative space, and I love your shots of it. 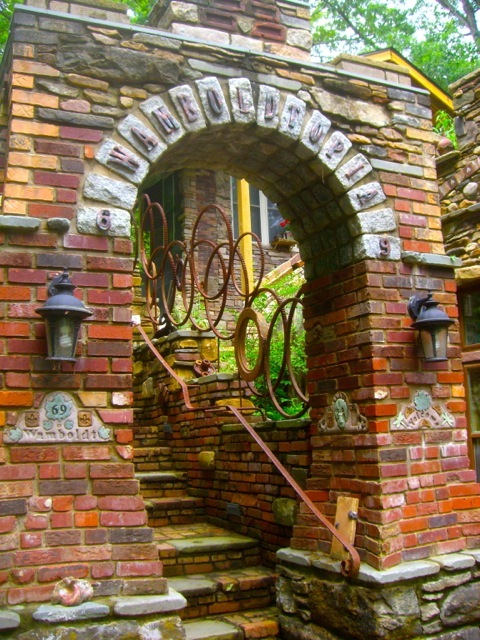 I keep looking at all my Asheville pictures and thinking: I wish I could go back and compose that one again. you must've felt honored to be asked to consult with the west asheville garden stroll on how to improve their walk... if not, i hope you did! the buffalo garden walk has inspired so many people. right on.